The funky, soulful sounds of Black Joe Lewis and the Honeybears will be filling the downtown Galveston airwaves on July 12, 2014 at Music Nite on the Strand. Mitchell Historic Properties and the Galveston Park Board present this free, family-friendly gathering, which takes place on the second and forth Saturday of the month from 6 p.m. to 9 p.m. through October and features live music and entertainment by a variety of talented musicians. Black Joe Lewis and the Honey Bears represent a revival in modern soul music and are sure to get any crowd off of their feet. Even though their roots are deep in the Texas music scene, they have performed all over the country and made appearances on The Late Late Show with Craig Ferguson, Late Show with David Letterman, Austin City Limits and Later... with Jools Holland. The band originally formed in Austin, Texas in 2007 but quickly broke into the national spotlight after being named as one of the "Ten Bands Set to Break Out at 2009's SXSW Festival” by Esquire Magazine. Their unique style is hard to classify under a specific genre, but acltv.com describe their sound as a “blend of raw electric blues, Southern-fried funk and turbocharged punk & roll”. Their influences have been traced back to Howlin’ Wolf and the legendary James Brown. Black Joe Lewis and the Honey Bears will perform at Music Nite on the Strand on Saturday, July 12, 2014 from 6 p.m. to 9 p.m. at Saengerfest Park, located at 2302 Strand in Galveston, TX. The event is free and open to the public. Visitors are encouraged to bring a lawn chair and their dancing shoes as seating is limited and a dance floor is provided. Saengerfest Park is located in the heart of Galveston’s Historic Strand Seaport Area at 23rd Street and The Strand. It is host to a number of monthly events including Music Nite on The Strand, which is sponsored in part by Mitchell Historic Properties (MHP). MHP oversees Galveston properties owned by the family of developers, philanthropists and preservationists Cynthia and George Mitchell, including commercial and residential properties located downtown as well as three hotels – Hotel Galvez & Spa, The Tremont House and Harbor House Hotel and Marina at Pier 21. MHP owns and preserves approximately one-fourth of the buildings in The Historic Strand Seaport Area including Pier 21® and Saengerfest Park. 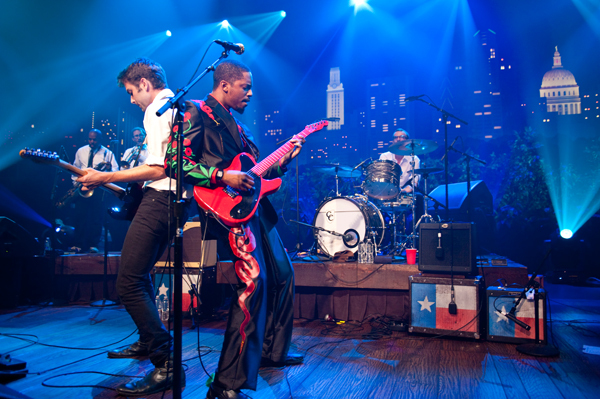 Black Joe Lewis and the Honeybears performing at ACL Live in Austin, TX. The funky, soulful sounds of Black Joe Lewis and the Honeybears will be filling the downtown Galveston airwaves on July 12 from 6pm-9pm at Music Nite on the Strand.